It used to be said that the history of India and the Indian Subcontinent didn't begin until the Muslims invaded in the 12th century A.D. While thorough history-writing may stem from such a late date, there are earlier historical writers with 1st-hand knowledge. Unfortunately, they don't extend back in time as far as we might like or as far as in other ancient cultures. "It is common knowledge that there is no corresponding equivalent on the Indian side. Ancient India has no historiography in the European sense of the word-in this respect the only ' historiographic civilizations ' of the world are the Graeco-Roman and Chinese ones..."
When writing about a group of people who died thousands of years ago, as in ancient history, there are always gaps and guesses. History tends to be written by the victors and about the powerful. When history is not even written, as was the case in early ancient India, there are still ways to extract information—mostly archaeological, but also "obscure literary texts, inscriptions in forgotten languages, and stray foreign notices," but it doesn't lend itself to " straightline political history, the history of heroes and empires" [Narayanan]. "Although thousands of seals and inscribed artifacts have been recovered, the Indus script remains undeciphered. Unlike Egypt or Mesopotamia, this remains a civilization inaccessible to historians.... In the Indus case, while the descendents of urban dwellers and technological practices did not entirely disappear, the cities their ancestors had inhabited did. Indus script and the information it recorded also were no longer remembered." When Darius and Alexander (327 B.C.) invaded India, they provided dates around which the history of India is constructed. India did not have its own western-style historian before these incursions so reasonably reliable chronology of India dates from Alexander's invasion in the late 4th century B.C. India originally referred to the area of the Indus River valley, which was a province of the Persian Empire. That's how Herodotus refers to it. Later, the term India included the area bounded on the north by the Himalayas and Karakoram mountain ranges, the penetrable Hindu Kush in the northwest, and on the northeast, the hills of Assam and Cachar. The Hindu Kush soon became the border between the Mauryan empire and that of the Seleucid successor of Alexander the Great. Seleucid-controlled Bactria sat immediately to the north of the Hindu Kush. 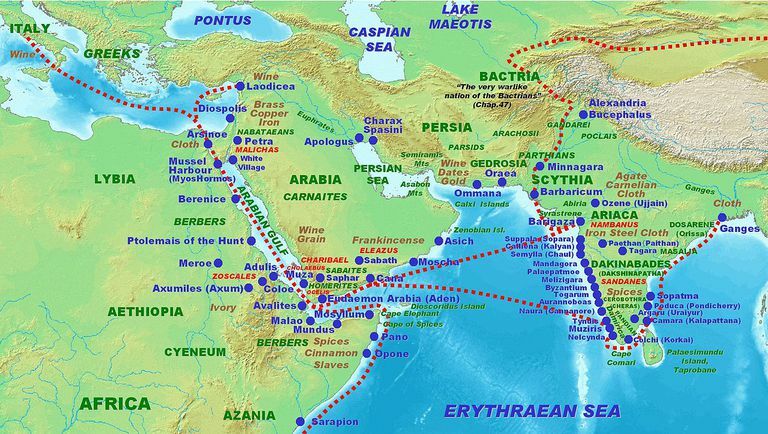 Then Bactria separated from the Seleucids and independently invaded India. The Indus River provided a natural, but controversial border between India and Persia. It is said that Alexander conquered India, but Edward James Rapson of The Cambridge History of India Volume I: Ancient India says it's only true if you mean the original sense of India -- the country of the Indus Valley -- since Alexander didn't go beyond the Beas (Hyphasis). Arrian's report says that Alexander was told by inhabitants of Gedrosia (Baluchistan) about others who had used that same travel route. The legendary Semiramis, they said, had fled through that route from India with only 20 members of her army and Cambyses' son Cyrus returned with only 7 [Rapson]. Megasthenes, who stayed in India from 317 to 312 B.C. and served as ambassador of Seleucus I at the court of Chandragupta Maurya (referred to in the Greek as Sandrokottos), is another Greek source about India. He is quoted in Arrian and Strabo, where the Indians denied having engaged in foreign warfare with any but Hercules, Dionysus and the Macedonians (Alexander). Of the westerners who might have invaded India, Megasthenes says Semiramis died before invading and the Persians acquired mercenary troops from India [Rapson]. Whether or not Cyrus invaded northern India depends on where the border is or was set; however, Darius seems to have gone as far as the Indus. Soon after the Macedonians, the Indians themselves produced artifacts that help us with the history. Particularly important are the stone pillars of the Mauryan king Ahsoka (c. 272- 235 B.C.) which provide the first glimpse of an authentic historical Indian figure. Another Indian source on the Mauryan dynasty is the Arthashastra of Kautilya. Although the author is sometimes identified as Chandragupta Maurya's minister Chanakya, Sinopoli and Trautmann say the Arthashastra was probably written in the second century A.D.